Can we be honest about some things? Really, painfully honest? My story doesn’t look the way I thought it would. I made some stops along the way that I wish I hadn’t. When I look back, I shudder at some of the choices I made, and if I let my mind dwell there for any time at all, I could become easily convinced that those choices define me. You see, Jesus went to the cross and died for my sins. He redeemed my past. He washed away my shame. I don’t have to carry regret any longer. I don’t have to cringe when people ask about those dark days because, you see—– light broke forth. Not long ago, I was standing in the kitchen at a friend’s house talking about how much I wanted to be there for one of my kiddo’s events when I had an epiphany. I needed to be perfect. I needed to attend every event. No matter how sick I was, I had to be the perfect mom, the perfect wife, the perfect everything because I had to make up for the choices I’d made in the past. I had to redeem myself. Can I set you free? You can’t redeem yourself. And you don’t have to. That’s what the cross was for. I can’t and I don’t have to earn redemption because my savior already did it. All I have to do is walk in it. He washed away the shame of all my yesterdays. Here’s how good our God is- what the devil means for harm he uses for our good. (Romans 8:28) So, those things that the devil hoped would bind us and destroy us, keep us locked up and ashamed forever—– when we surrender them to the Lord and allow him to redeem them, he adds them to our ministry tool belt using them to free others. You see, whom the son sets free is free indeed. (John 8:36) – free to be used by God and to set others free. If today you are carrying around the shame and regret of yesterday, can I remind you that he has washed away the shame of yesterday? Lay it down. Walk in the freedom and redemption purchased for you on the cross. Today’s post is brought to you by my friend who just so happens to be a very talented author, Brianna George. 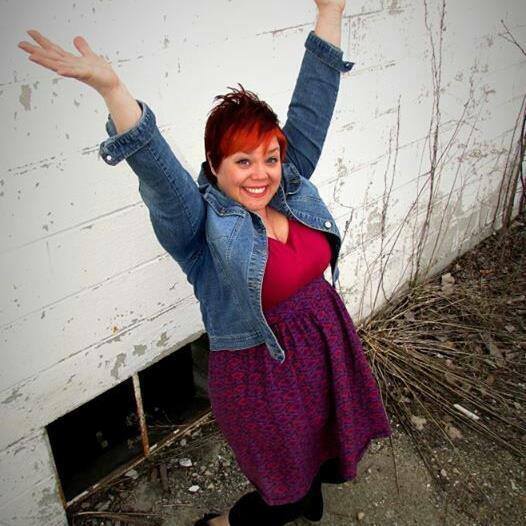 Brianna is a Speaker, Teacher, lover of wild colored hair, part-time writer and full-time Encourager. She’s a mom to two spicy boys and has happily married for 12 years. More of her writing can be found at her awesome site. I am terrible receiver of tangible help. I mean terrible. I second guess gifts. I ask “are you sure?” a million times when someone offers me something that I feel is more than I deserve. I have refused gifts and physical help when I needed it. I experience guilt and humiliation at being on the receiving end of financial blessings. I tend to always try to “give-back” with a return blessing to someone that has given me their time and energy… And I don’t enjoy when I receive a surprise and can’t reciprocate. I am a terrible receiver. This is pride…absolute pride…and I abhor its effect on how I receive. In the last few years, and especially the last few months, God has been teaching me how to be a better receiver and it has been a bittersweet experience. As a believer, we are constantly put in the position of receiving. We receive daily mercy, grace, hope and love from our Father. For some these are more easy to accept…or at least we have fooled ourselves into believing we freely accept them. But too often we find ourselves doing something we don’t want to do (or don’t believe should be done) in the name of Jesus as a believer. And therein lies the root of the problem; Unbelief. Unbelief tries to shimmy its way into our core and replace Christ’s truth of who we are, with the conclusion that we are unworthy, not holy enough or lacking, despite the fullness we have received in Christ. This unbelief can translate over into both tangible and spiritual receiving. There is an art to receiving. Proper receiving is done in humbleness, gentleness, and gratitude allowing the giver to be blessed. I am quite experienced in giving and understand how for the believer this divine sanction goes beyond the feel good sensation in helping someone, but gives them confidence and convinces them to continue listening to the Lord’s instruction in other areas of their lives. What I have been challenged in understanding is regarding the art to receiving well and how this allows me to accept blessings received beyond the tangible gift a giver is bestowing me. A major part of receiving well is experiencing enjoyment in a season of constant receiving. Enjoyment beyond being content. Enjoyment in receiving out of necessity and not having my own self-sufficiency in any area of my life. See I can be content in this season my family finds ourselves. The contentment that we are in a season of relying on daily manna to survive. The daily manna that is spurring us to spiritually thrive. But there is a difference in contentment and enjoyment. I have asked myself countless times why I am not enjoying this season of receiving. Why am I not receiving well? What is the lie I am believing that stops my enjoying the amazing and miraculous gifts our God has tangibly been showering us with and providing for all our needs? One can not live in joy and fear at the same time. Much like the reality of grace, we have previously talked about, we can not both live in grace and condemnation. Living in joy with positivity can not be lived while we are in fear and allowing negativity in our lives. Our joy and enjoyment in receiving is not a bad thing. For it is our Father’s good pleasure to give us the kingdom. (Luke 12:32) We do not have to fear the receiving. There is no judgment or condemnation from our Lord in receiving that which he has ordained for us to have in his timing. I say this, yet I admit at this time I am not fully convinced of it yet…Even this past month as I prepared for my completely donated trip to Austin, which I know I was supposed to go on, I questioned if I REALLY SHOULD have gone and accepted the help to get there because I feel a pang of not being self-sufficient…which creates fear…Oh, pride why do you have to ruin everything? Where are you experiencing fear that is causing you to not be able to enjoy the season you are in? Do you struggle with being either a good receiver or a good giver? Yesterday, I was sitting comfortably on my favorite spot on the couch, during one of those rare moments when Avery is otherwise occupied and there is no competition for the T.V. I settled on one of the popular home-buying shows I’ve come to love but never have the time to watch. You know, the kind where they state their max budget and wish list and then end up with the home of their dreams within the hour? And it struck me, how this has become our approach to life in general. Here’s what I’m willing to invest and here’s what I’m expecting to get in return. I’ll spend x amount of hours with my children each week, doing homework, playing games and in general edification. In return, I’m expecting children who excel in everything, graduate at the top of their class, marry someone who takes them on nice vacations, and for them to obtain well-paying jobs which afford them a standard suburban American life. I’ll spend 4-5 hours a week at the gym and 1-2 hours a week entering my meals into my app. As a result, I expect to be enviably fit, be healthy all of the days of my life and to appear 10-20 years younger than I am at all times. I am willing to drive 10-20 minutes to a church where I will spend 1-2 hours a week. I will place twenty bucks in the offering basket every other week. In return, I would like programs that make all of my children all-star Christians, people that become my best friends, a brand spanking new marriage (meaning, I expect to actually like my husband within six weeks or my money back) and free child care for my infant, on demand. Have you noticed this consumer Christianity in your churches? What about in your own faith journey? I’ve been to the mega churches where a mass spiritual meal is provided to everyone. As first, this really bothered me and I wondered, “What if you needed something different, something not on the prepackaged plate?” But then I thought maybe that’s what your Monday-Sat walk with Christ is for. I’ve also been to the smaller churches where you could walk right up to the altar, join hands with your brother or sister and fight together for what you need. Some churches offer small groups or mid week bible studies for the more customized spiritual meals. But I’ve also seen pastors who have 70-80 hour work weeks, killing themselves trying to meet the demands of their consumers, I mean members. I’ve often wondered if, over time, the members were becoming more dependent on Jesus, or their pastor. In my mind, the local church body is a place where I am served, and I serve. It’s a place where I have community and where I share what I have with those who don’t. It’s a place where I do life with others, worship side by side with others, and experience the miraculous grace of God with others. It’s a place where a use my gifts, a place where I grow and where I train up others behind me. It’s both a training center and a hospital. It’s a place of beauty and laughter, living and loving. Imperfection and grace, power and anointing. But maybe not shopping? So, I’m curious. What does church look like to you? Do you believe our modern churches are a reflection of Jesus? Are they effectively loving and revolutionizing the world for Christ? Are we playing the part we were created to play or still trying to decide if it’s worth the investment? How many amazing churches have we passed up because they didn’t have everything on our “wish list”? Is it possible that we’re missing the point? Are we consumer Christians? Over the weekend, I went on a crazy adventure to Austin, Texas. There I finally met over two hundred of my favorite people for the first time. We’ve all been on this wild ride of launching the (wildly fabulous, must-read) book “For the Love” together. Within our online group, we’ve laughed together, cried together, grown together and been challenged together. But, for the most part, we hadn’t actually been together—until this weekend. I think we were all a little overwhelmed and I know I’ll be processing it all for weeks to come. One thing I heard over and over again was, “It’s so weird to finally hear your voice” or “It’s so cool to finally put a voice with the face.” It’s true. I had failed to realize how much of someone we come to know through voice alone. The way they pause on a word, the love they somehow communicate or the life they impart just with the sound of their voice. My husband Ryan has a voice that drew me in from the beginning. It’s just like him—stable, strong, peaceful, kind. We spent many hours on the phone in the early days of our dating relationship. How I looked forward to the sound of his voice. My daughter Avery crinkles her nose when she’s saying something with extra emphasis. Her voice tells such story, sings a song. My son Hayden’s voice tells what the rest of him does—he’s becoming a man and ever so quickly. First of all, Praise God for friends (both new and old) who aren’t afraid to step on your toes or up get up in your business a bit when it’s called for. How deeply grateful I am for the people God has surrounded me with who are constantly sharpening me, inviting me to a deeper place in Christ. But secondly, anytime I start to sound or feel frantic I know that I haven’t been spending enough time listening to my Father’s voice. Because he speaks peace to storms. He quiets my heart when the wind and waves pound the shores. When I feel insecure, unsure of who I am, he speaks and I am reminded that I am HIS and that is all that matters. When I feel unloved and unseen, he speaks and I reminded that I am seen, known and loved by the God of the universe—anything, anyone else is just a bonus. Before I even got home, I began quieting those other voices, the ones drowning out the voice of my Father. All the noise, all the distractions—they had to go. In the silence, do you know what I heard? His voice. Can I gently remind you that whatever you have to release, whatever you have to silence in order to hear his voice, it’s worth it? How he longs to speak with us, to walk and talk with us in the cool of the day. This is what we were created for, to commune with him, to know him and be known from the depths of our being. What can you lay down today? What voices can you quiet in order to hear THE VOICE? I promise you, it will be worth it. Once a month I travel to the great state of Michigan to receive IVIG (an infusion of donor antibodies to help a sister out) I see my hero/mentor/doctor/favorite person, get my infusion and then head on home. This month I was about midway through my infusion as well as my book when my daughter’s preschool called to say that she was running a temp of 102 and would need to be picked up immediately. I could hear her crying in the background. Did I mention I was in Michigan? Unable to rescue her? This shattered my mom heart. A dear friend came to her rescue until Dad could get there from work, but not before she started throwing up. I changed my flight from my phone while I was still mid-infusion. My baby girl just couldn’t do this without her Mommy. I had to be there. By midnight, I was hoping that if I had an amoeba of some sort it would just hurry and finish the job. Seriously. I’ve been in a lot of pain over the last few years, but the headache was literally unbearable. As dawn broke, I knew it could be dangerous to let this continue on much longer. Husband called the doctor and the doctor said, “No more monkeys jumping on the bed.” Actually, he said for us to head to the ER. And the thought of having to ride in the car, or sit in the waiting room when I didn’t even have the strength to put a bra on or walk by myself was more than I could take in. As we were driving the 2.5 miles from my house the local hospital, me with a bucket in my lap, just in case—I thought about a stories I’d read in “Half the Sky” and “Kisses from Katie” of women traveling 18 hours over dangerous terrain to get to a hospital to give birth, dying from complications before they ever arrived or delivering on sidewalks out in front of the “hospitals” because there were no delivery rooms available. Within minutes of the administration of my meds, I was no longer sick to my stomach and it was truly a gift from God. Relief would never cover what I felt. And while it’s taken a few days for the headache to subside, and it turns out that I had a virus (with a side of strep) and not an amoeba — the suffering was real. Yesterday we took Avery to the pediatrician. She cried about the swab they crammed down her throat but perked up when we handed her some “good job” Skittles. She tested positive for Strep. After just one dose of her antibiotics, she woke up this morning without a fever. But I can’t stop thinking about the parents who don’t have access to healthcare, the ones who can’t go and get an antibiotic for their child. How do they end their children’s suffering? I keep asking the Lord how I help them. I know that their lives don’t matter any less to him than mine does. How do we help them? I need to know. How are you helping? Can you tell me? What ministries are you supporting? I know a few that a reputable, doing good work. I’ll list them below. Can we collaborate? Can we pray? Can we join together and do what the body of Christ is called to do? People are suffering. I want to heed the call to help them. Let’s do some awesome stuff for our King.